Home office conversion is a lot more than it sounds like. While it seems like it’s a cinch, the home office conversion process is a lot more involved. 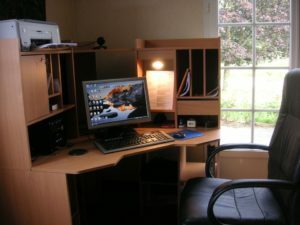 This is due to the fact that a home office and bedroom have two completely different functions. Which ultimately means you’ll need certain elements for the makeover to actually serve as a useful home office space. A widely known fact in the real estate sales profession is buyers typically strongly object to a room being used for a purpose different from its original intention. So, the first tip is to make it simple and easy to convert back if you will sell in the future. If you totally convert the space, making it difficult to return it to a bedroom, that’s going to present a problem when it’s time to sell. In other words, your bedroom-home office conversion should provide function and style but also be simple to transform back to a bedroom. Strategically place the computer and peripherals. This sounds like a no-brainer but it’s a bit more complex than just choosing a wall or window. Think seriously about how you’ll use the space and don’t forego going through the motions to best place everything you need. Use the closet as a filing and storage space. If you need to keep hard copies of documents, products, or shipping materials, the closet will be the perfect location. Choose appropriately sized furniture. Speaking of furniture, you also need to select appropriately sized pieces for ample space. Add more light and protect the floor. If there’s one thing an office needs, it’s light. So, take full advantage of any natural light and add more interior lighting. Also, if the floor is carpet, tile, hardwood, or composite, you’ll need to protect it from the rollers on your office chair. When you need junk removal for your home office conversion, go ahead and phone 800-433-1094 or visit Junk Garbage Removal.